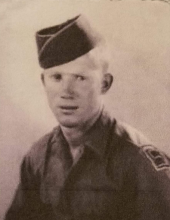 Mr. Floyd Thomas Hancock of Walnut Ridge, formerly of Harrisburg, Arkansas, departed this life Sunday, April 14, 2019, at the Eaglecrest Nursing and Rehab Center in Ash Flat, at the age of 93. He was born October 15, 1925 in Twin Creek, Arkansas, the son of the late Lee Roy Hancock and Samantha Jones Hancock. Following high school, Floyd joined the U.S. Army and served in Belgium, France and Germany. He was discharged in 1949 and awarded the EAME Campaign Ribbon with 2 Bronze Stars, the Army of Occupation Ribbon (Germany) and the Victory Ribbon with 3 Overseas Service Bars. He was extremely proud of his service to his country. He married Lora Jean Deckelman in 1947 and they enjoyed 72 years together before her passing March 4, 2019. After the service, Floyd farmed, did carpentry and mechanic work and owned his own gas station. He enjoyed hunting and fishing and loved wood carving. He loved to craft and was always making something. He was a huge Cardinal Baseball fan. In addition to his parents, he was preceded in death by his wife, Lora Jean Hancock, two sons, Tommy and Jerry Hancock, two brothers, R.D. Hancock and Reuben Hancock, and four sisters, Dolly Hancock, Virbie Hutchins, Adie Riley and Edna Varnor. He is survived by one daughter, Reta Hare of Hardy, two sisters, Elsie Davis of Harrisburg and Joyce French of Cherokee Village, AR and several grandchildren, great grandchildren and one great, great granddaughter. Funeral services have been set for 11:00 a.m. Friday, at the Gregg-Weston Funeral Home Chapel in Harrisburg with Rev. David Mitchell officiating. Interment will follow in Bolivar Cemetery. Those serving as pallbearers will be Brody Walls, Keith Burns, Steven Walls, Tim Rodney, Rhett Presley and Tyler Presley. Friends may visit at the funeral home Thursday evening, 5:00 – 7:00 p.m.
To send flowers or a remembrance gift to the family of Floyd Thomas Hancock (Gregg-Weston FH), please visit our Tribute Store. "Email Address" would like to share the life celebration of Floyd Thomas Hancock (Gregg-Weston FH). Click on the "link" to go to share a favorite memory or leave a condolence message for the family.